This small camping ground faces north onto Home Beach and enjoys a sunny position, and protection from the prevailing south-easterly winds. The camping ground is situated along the broad expanse of Home Beach and is ideal for those looking for a lazy beach break and easy access to Point Lookout, or to Flinders Beach. 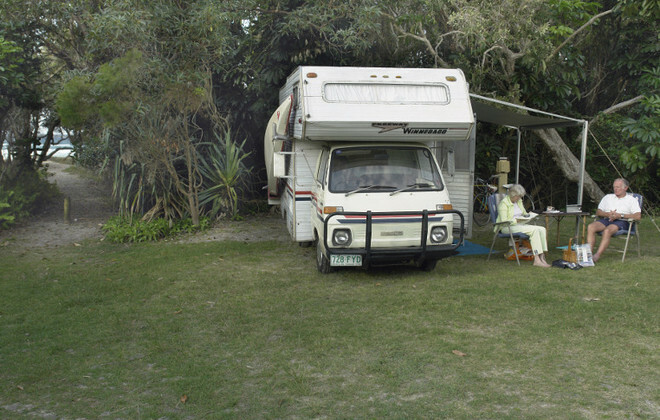 12 unpowered tent/campervan/trailer/caravan sites, 10 powered sites.No cabins. No onsite Manager. 4WD Tours, Art Galleries, Bush Walking, Cycling (bike hire), Day Spa’s, Fishing, Golf Course, Heritage Walks, Lawn Bowls, Kayaking, Markets, Museum, Sand Boarding Scuba Diving & Snorkeling, Surfing (Surfing lessons), Swimming, Tennis, Whale Watching (July~October), Wildlife Walks, Yoga (beach yoga). 12 unpowered tent/campervan/trailer/caravan sites, 10 powered sites. By clicking "Submit" you certify that this review is based on your own experience and is your genuine opinion of "Home Beach Camping Ground" and that you have no personal or business relationship with "Home Beach Camping Ground" and have not been offered any incentive or payment originating from "Home Beach Camping Ground" to write this review.